Emergency workers and first responders face a high risk of danger and injury on the job. They may be involved in a car accident, stuck in a burning building with severe smoke inhalation, shot, or stuck in a tight space where self-injury is necessary to break free. They are sometimes killed in the line of duty. If you are an emergency worker or first responder who is injured at work in Boston or the surrounding communities, the workers’ compensation attorneys at Pulgini & Norton may be able to help you pursue benefits. For purposes of Massachusetts' workers' compensation law, you can recover benefits for a work-related injury if you are hurt on the job and you are an employee rather than an independent contractor. You are able to recover regardless of fault. One potential challenge for an emergency worker or first responder is in securing benefits when he or she has a pre-existing condition. As long as the pre-existing condition is exacerbated or aggravated by a work injury, and the work injury is a major cause of the physical disability, people with pre-existing conditions should still be able to recover. The Department of Industrial Accidents (DIA) administers the workers' compensation system. The DIA has a four-stage dispute process with these levels: conciliation, conference, hearing, and review board. Only after administrative remedies are exhausted can either you or the insurer appeal to the Court of Appeals. If an insurer has denied liability for your claim, it is important to consult an experienced workers' compensation attorney. The rules in this area can be complex and challenging. One particular area of difficulty for emergency workers is claiming benefits for psychiatric injuries. In some cases, emergency workers or first responders may experience PTSD after a very stressful accident. For example, an emergency worker who is shot or attacked may suffer not only physical injuries, but also psychiatric ones. PTSD after a violent event may leave a first responder completely unable to work. To collect workers’ compensation for PTSD, you will need to provide the insurer with medical evidence that a work event directly caused your PTSD. A doctor will evaluate you, and the insurer may try to frame your PTSD symptoms as the result of something that is not work-related. Within the workers' compensation system, a psychiatric reaction to physical pain is distinguished from an independent psychiatric injury. For example, you can become depressed due to the loss of a limb, but this is different from PTSD arising out of the trauma of being violently attacked. If you are able to show that the PTSD was caused by a serious work event, it may be possible to recover temporary total disability, partial disability, or permanent and total disability benefits for it. The extent of these benefits depends on your average weekly wage and degree of incapacity from a workplace injury. 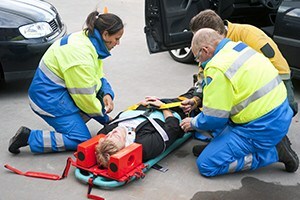 If you are injured or a loved one is killed while working as an emergency worker or first responder, it may be important to secure representation from a knowledgeable workplace accident lawyer. Pulgini & Norton represents employees throughout the Boston area, as well as in Quincy, Andover, New Bedford, and other Massachusetts cities. Call us at 781-843-2200 or contact us via our online form for a consultation.